The city zoo is a significant example of garden design in the 1960s. In keeping with the period’s zeitgeist, the entire complex was comprehensively redesigned for the National Garden Show in 1967, creating a ‘green path’ for pedestrians from the railway station to the city centre. The municipal gardens have been listed as a cultural monument in accordance with Section 2 of the Cultural Heritage Law (DSchG) of Baden-Württemberg since 2006. The design idiom of the period’s landscape architecture is clearly visible in the geometric shapes of the lakes, the polygonal layout of the park paths and the design of the smaller architectural features. The city zoo also includes two architectural peculiarities of the period. 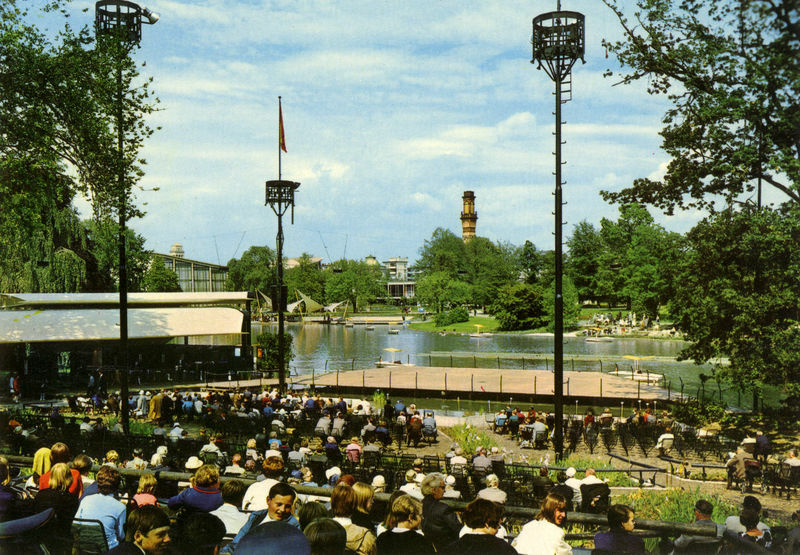 The lake stage, which was built by Gernot Kramer, Christoph Blomeier and Hans-Georg Bühler, is the central feature of the concert garden. It consists of an area that is roofed with winglike, rotating elements and a wooden platform on the lake. It was renovated between 2013 and 2015. The 60s charm of the Milchbar (milk bar), somewhat hidden at the foot of the Lauterberg, still captivates the imagination of visitors today. And it still sells its own milk and ice-cream specialities.